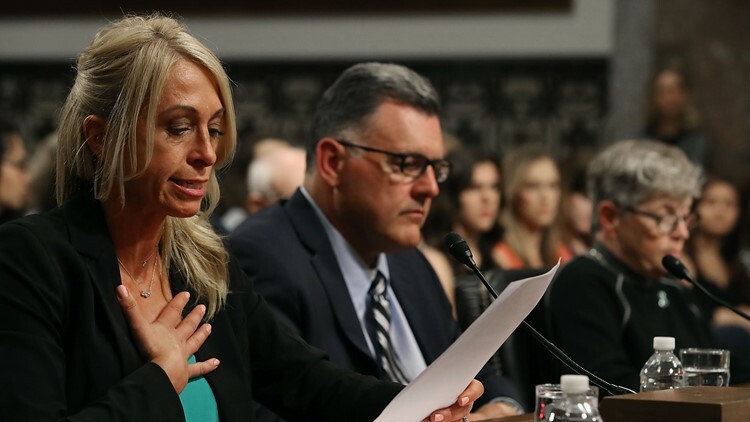 USA Gymnastics parted ways with Faehn after she was criticized by Larry Nassar victims. Faehn was with the Wolverines for a meet at Alabama on Friday, a day after she agreed to work for the school through this season. "I am heartened at the outpouring of support that I received this weekend," Faehn said. "I am thrilled to join the University of Michigan and am appreciative of the careful consideration demonstrated by the administration. I am excited to work with these young women and am thankful for their enthusiastic support." Michigan athletic director Warde Manuel said he supported the hiring recommendation made by gymnastics coach Bev Plocki after reviewing her role with USA Gymnastics and her coaching career. "The well-being and safety of our student-athletes is always our highest priority," Manuel said. "Our current student-athletes had a prominent voice throughout this search process to provide their perspective. This included a meeting between me and the captains before a final decision was made. "After our exhaustive due diligence, we felt comfortable that Coach Faehn reported all information available to her regarding Larry Nassar and that she cooperated fully, including voluntarily participating in all investigations and offering testimony before Congress. Neither an internal investigation by USA Gymnastics or a criminal investigation by the FBI have assigned culpability or resulted in any charges against her." "Following a comprehensive search process working closely with our administration, I am pleased to add Rhonda Faehn to our staff," Plocki said. "I have known and respected Rhonda Faehn for over two decades. Her accomplishments in our sport speak for themselves. Her technical knowledge and experience will greatly benefit our student-athletes."